I never intended to paint animal portraits. I didn’t intend to move to New York City, either, but I met my boyfriend Chris Wells and fell in love, and so I did. Though I had been a painter for years with a gallery career in Chicago and lots of work in private collections around the country, I was struggling to find a way to enter the NYC art world. On a lark, I decided to make some prints of my work and sell them on Prince Street in SOHO. The experience of selling on the streets of New York was many things: boring, discouraging with occasional moments of connection and fun. One of these moments happened when the head of a branding firm called Safari Sundays happened upon my table and bought a print of a painting called SHEEBA, from a recent series of paintings that I had just finished of thrift store dolls captured against bright, starburst backgrounds. A few days later the guy who purchased Sheba contacted me, asking if I still had the original, which I did, and he bought it for his very glamorous office on Thompson Street. A few weeks after that he wrote, asking if I would paint his black Pug SMUDGE in a similar style. I went to his office the next week and took pictures of Smudge – who was adorable – and that week I began painting my first animal portrait. 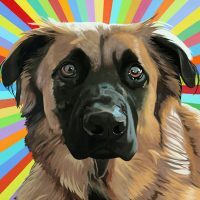 Working on a large scale was a blast and – here’s the thing – I love animals, especially dogs. So it was a great fit for me. Shortly after completing the Smudge portrait a friend who had a pug saw it and asked me to paint HIS pug. I did. Then I thought, hmmm. I love to paint, I love animals and there seems to be a demand for these, so I started Robert Lucy Animals. 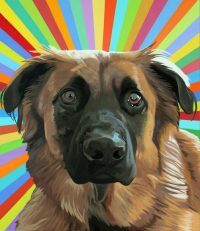 My first official commission is still my largest to date, a beautiful Shepherd named SATCHI. Later, the gentleman who commissioned me to paint SMUDGE told me that whenever SMUDGE entered the room where the portrait was hanging, he would bark at it. 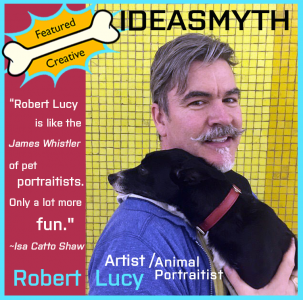 ~~~Robert Lucy has been painting and drawing professionally for over 25 years, and loving animals his my whole life. He has a B.F.A. and an M.F.A. from The School of the Art Institute of Chicago where he lived for 15 years and made a reputation for himself painting still lifes, landscapes, portraits and colored pencil drawings. He grew up in St. Louis, and after leaving Chicago spent several years on the Oregon Coast. In 2006 he moved to NYC, and most recently has moved his home and studio to Woodstock, NY in the Catskill Mountains.